There are many ways to express gratitude and one of them is by holding a traditional ceremony. "Gawai Dayak" is the only one, where this traditional ceremony is held routinely by the Dayak people in Pontianak, West Kalimantan and it has been run for a long time ago. The main purpose of this ceremony are as a form of expression of gratitude to Jubatan (their Lord) for an abundant harvest, also to invoke the same thing (the abundant harvest) in the future. "Gawai Dayak" is usually held for 3 months by the Dayak people in Kalimantan, especially for Dayak Iban and Dayak Darat as a gratitude form of harvest result. There're a number of ceremonies that must be held in Gawai Dayak. Those traditional ceremonies become like a series of formal procession that must be passed. Several kinds of traditional foods and a number of offerings is also prepared as one of the main elements in the ceremony. Along the times and issue of interest, nowadays the ceremony of traditional Gawai Dayak gets some adjustments, but still keeping important elements especially in the sequence and procession of ceremonies itself. Together with local government, Gawai Dayak is only held for a week and routinely held on 20 May every year. The name of event that contain the cultural interest today is known as "Pekan Gawai Dayak" or " Week of Gawai Dayak"
Week of Gawai Dayak is initiated firstly from the desire to mutually reinforcing and introducing Dayak's tradition, also as an event of preservation of ancestor's tradition. Gawai Dayak itself is a traditional ceremony that becomes a medium to strengthen Dayak tribe and as an important part of traditional week. The awareness was started in 1986 where it was signed by the formation of "Sekretariat Kesenian Dayak" (Sekberkesda). Sekberkesda was assigned to perform and making a concept the art and culture of Dayak, which then initiating the week of art and culture that today known as Pekan Gawai Dayak. Since 1986, Pekan Gawai Dayak had been performed well organized and it also get finance from the local government. Mentioned that "Pekan Gawai Dayak" contains political elements because it's not traditional purely but contains the interest of tourism development even political interest. However, Pekan Gawai Dayak has been proven to give positive effects for the preservation and development of Dayak's culture in West Kalimantan. It become a lighters of love for the local culture of Dayak, which then stimulate preservation effort and tourism promotion. Pekan Gawai Dayak surely has potential as an event from economical side will give a positive contribution to the people and their region. Regardless of various issues of political interest, Pekan Gawai Dayak also gets support from Dayak cultural society because however, this event has the interest of local cultural preservation. 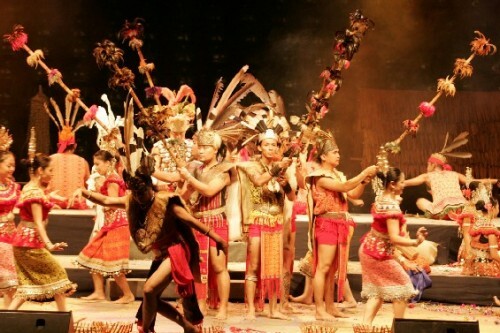 Sekberkesda itself gets support from at least 23 dance houses as a representation of the Dayak sub group that is located in Pontianak, West Kalimantan. Procession of Gawai Dayak and Week of Gawai Dayak. Gawai Dayak is an implementation of ceremony after harvest which involve a series traditional ceremonies as a gratitude form to their Lord for the good and bountiful harvests. The implementation of Gawai Dayak can take up to 3 months, usually on April until June. The performers ceremony will wear traditional costume decorated with traditional jewelery like beads and traditional silver art. "Nyangahayn manta" divided into 3 parts as follows. The first is Matik, seems like a ceremony to notify the ancestor's spirits and Jubata (their Lord) about the ceremony that will be held soon.The second is Ngalantekan, it's aims to invoke the salvation for all parties who contributed to the ceremony, and the last is Mibis, a ceremony to purify the nature. In ceremony of "Nyangahatn manta", according to its name, the offerings which is usually prepared are uncooked groceries (manta). The next ceremony is "ngadap buis", the main traditional ceremony from all procession of "ngampar bide" where all ceremony equipments are available. In this step, the offerings (buis : cooked food) are devoted into ancestor's spirits and Jubata, as a gratitude expression also to invoke blessings. Ceremony of "Ngampar bide" is attended by dayak figures which have a role in preparing "Gawai". They discuss about preparation, prepare and execute the main ceremony itself. In the closing ceremony will be held "gulung bide" (roll up the mat) as a sign of the end of ceremony. Week of Gawai Dayak in modern time still perform a series of ceremony above but it don't need long time. This ceremony is only held in a week, for every 20th May as described by Governor of West Kalimantan at past, Kadarusno. This ceremony isn't only enlivened by ceremonial events but also various art events that involve the people in Kalimantan. Cultural colloquy, performing of traditional dances that usually as sign that the Week of Gawai Dayak has begun. There're also various cultural attraction from Dayak and traditional games. There are also many places that serve traditional food, some handicrafts, and art products. Even, there are a number of contest that occur during the Week of Gawai Dayak such as traditional cooking contest, and another interesting contests.